There’s been another male sharing my bed for the last eight years. I first fell in love with him when my daughter sent a somewhat desperate email in 2008 with his picture. He had beautiful blue eyes and a mane of soft luxurious hair. He was so so so cute! OK so I need to stop with the Buzzfeed type gotcha lead-in sentences; yes, Riley was a cat. And now he’s dearly departed. And I miss the old guy like, well, like a sweet buddy who has devotedly followed you around for eight years. A friend of my daughter’s roommate was seeking a new home for her eight-year-old cat, Riley. She was facing that frequent dilemma: my boyfriend or my cat? The boyfriend apparently won out; she said it tore her heart in two, but she needed to find a loving home for Riley. My daughter brought him home to us for a weekend visit, to see if he adjusted to us and we to him. 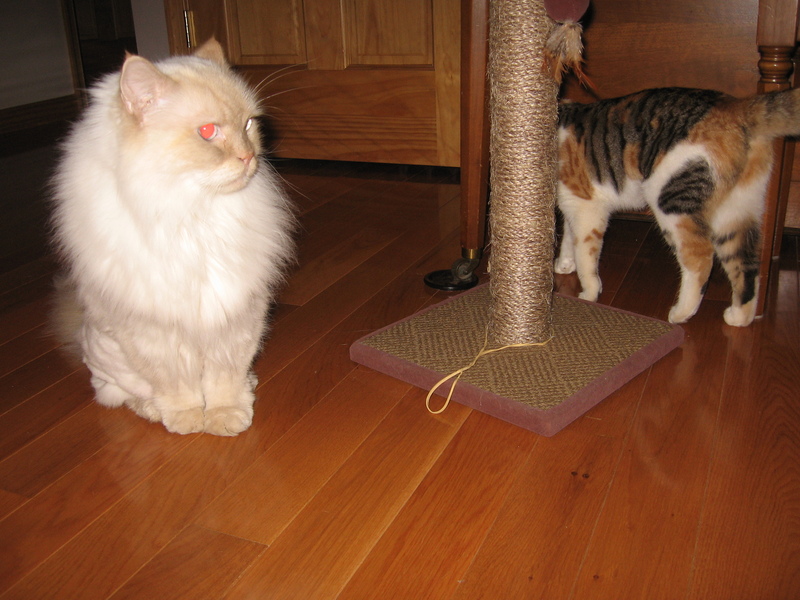 He was Himalayan and the most gorgeous cat (in my eyes) we ever owned: beautiful white coat of long fur and azure eyes. After cowering a few hours behind my washing machine in the utility room, he came out and eventually made up to us. He was sociable, debonair, devoted, and dignified. 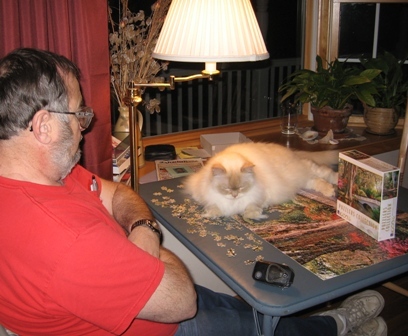 He amused our visiting female family members by sitting on, playing in, and sniffing their intimate clothing if they happened to leave items laying on a floor or bed somewhere. 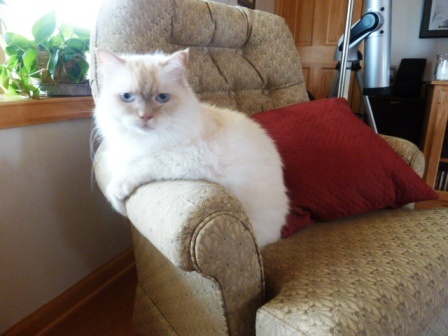 His previous owner, or someone, had had his claws removed, which meant he was an indoor cat. Or should have been, but the call of the wild “I wanna go out”* was strong. Guardedly, we allowed him walkabouts since we live in the country. He would step gingerly on the grass as if luxuriating in the thick carpet. We watched him closely, for fear neighbor dogs or dipping hawks would spy the slow and juicy target, since he had no claws to defend himself. But basically he was a pampered indoor cat who nobly tolerated our dogs, first Fable and more recently, the new kid on the block, Velvet. We owned another stray when Riley moved in with us, by name of Pixie. Pixie developed an open sore which would not heal, likely cancer, and had to be put down a year or two later. Eventually my youngest daughter, living at home a few years post college, pleaded to adopt newborn Paisley, a farm cat whose mother died and needed not only a home, but early syringe feedings. The two cats were a picture; I took lots. 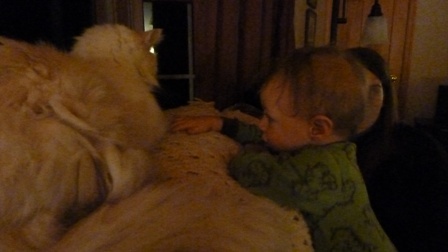 So Riley ruled our animal world with his gentle ways. As he grew older, his soft fur grew more matted. We had to have him shaved at the beginning of most summers. They say a cat’s tongue loses some of its natural roughness which enables them to comb out tangles. 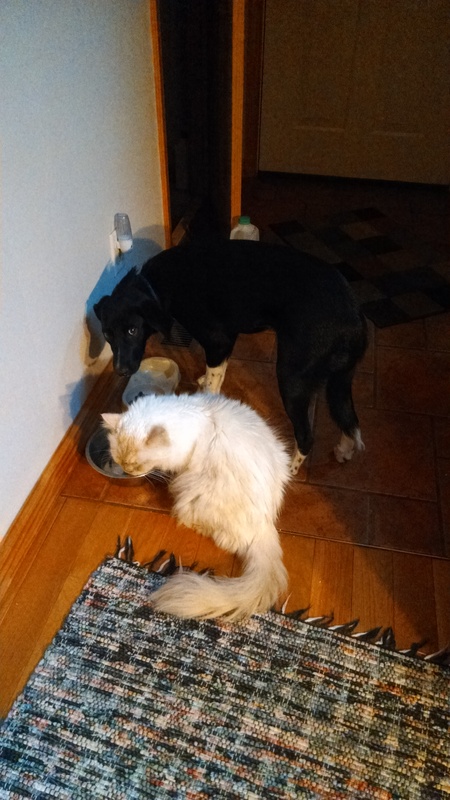 Sharing a water bowl with new dog, Velvet. In the last two years he also began having thyroid problems causing him to urinate frequently; we consulted a vet, who wanted to put him on medication and a special diet. 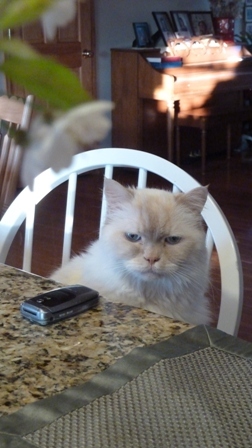 As a Himalayan, he was subject to hairballs and frequent vomiting anyway, all his life. I’d love to have the money back I spent on paper towels. But we were reluctant to invest heavily in medical care for an aging cat. I did not wish to manage keeping our two cats apart while eating, especially through the day when we were both gone. About two weeks ago he could no longer jump up onto the bathroom counter to get a drink, which he adored. His barely ate. I sensed his time was ending. Our family came home for Easter and grandson Sam discovered the joys of Riley, even though Riley was less sure about his new little friend. The Sunday after Easter, Riley enjoyed what turned out to be one final walkabout.He pushed his way out the patio door onto our gated deck, where I thought he could safely take in the fine spring day. But then he slithered through the rails of the deck and jumped to the ground, even though our dog was right below, playing with neighbor dog, “Blue.” Velvet and Blue just kind of stood back and followed the old guy as he took his lingering walk to the newly tilled garden. He headed back of our shed, and I think he might have just kept on walking through the pasture, maybe down to our woods to pass away quietly, I don’t know. But we intervened of course, brought him back inside. We worried through Monday night. Tuesday morning I could see his breathing was very shallow. I covered him with a towel. He did not seem to be in great pain. Should we put him down, shorten his suffering? I decided to go home over lunch on Tuesday and resolved to call the vet if he was still struggling. I had a busy day (and week) but thought I could squeeze in a humanitarian visit to the vet. But Riley saved us and himself a final, possibly painful move and trip. He was at peace. We buried him on a knoll overlooking our land, near the dog, Fable. 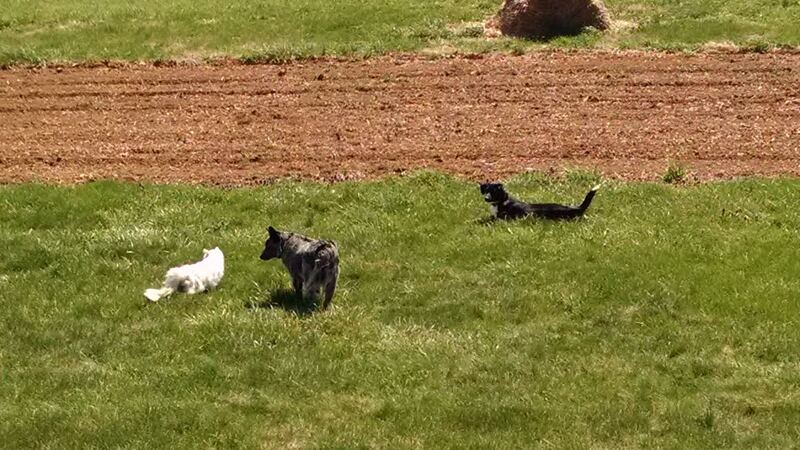 Can you find all three pets in this picture? This past Saturday morning doing my routine cleaning, I found a small clump of his hair near a wastebasket in the bathroom. It was a piece I’d trimmed out earlier. Oh. Such soft fur. Such a sweet cat. He will live on in pictures, memories, and stories. As is always the case when we lose a loved one, I had flashbacks of “oh he should be sitting there in his chair.” No Riley hopping up onto the bar stool beside me as we eat. No begging for that morsel of buttered toast he’d come to love. No climbing up beside me and plopping himself in front of my computer monitor, to my annoyance. I’d coax him to the side, tell him to sit over there, and I tapped the desk impatiently to show him where. Some of these things I’ll miss. Some of them I am happy to have over. Pets are a good reminder of the care needs we all have as we age. The truth is, I was not that much of a cat person. Riley charmed his way into my heart with his big blue eyes. I would have to count him as the first cat I called “mine.” Oh, as a Mom, I may have been chief cat caretaker but seldom really took time to do more than feed, water, clean litter boxes, take them for shots, and perfunctorily pet them now and then. Riley was one of God’s creatures who needed love and care: we gave him both. He gave back his own devotion and affection. I will always remember his eight year sojourn in our home. 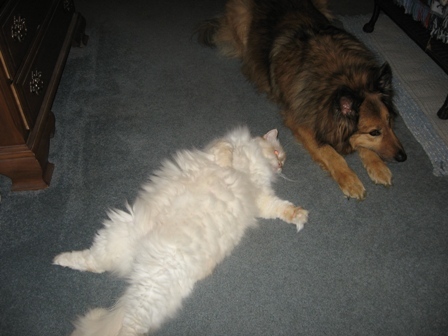 RIP Sir Riley Davis — 2000-2015; shown here with Fable, our dog from 2001 – 2013. I wrote about Fable’s passing here. We buried them near the same spot. Have you ever had a pet who you came to love unexpectedly? How? I’d love to hear. My thanks to Pert Shetler and Kathy Duford at Waterway Animal Hospital for all of their informal pet advice. 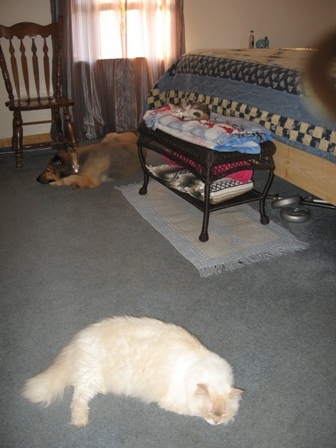 Although we have never had cats, we have gone through similar experiences with dogs that we had through the years. This was a beautful tribute to Riley. 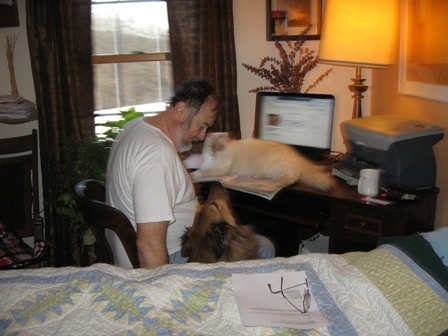 Poignant post – I’m not a pet person, but I can understand the attachment when we had Me-Too in the years the children lived at home. Marvelous hook and title: how fortunate your cat was named Riley. What a cushy life he had and you to record it here. Thanks for commenting even if you’re not a pet person. Yes, Riley’s name was made for a post. 🙂 And I heard from the woman who gave him up–roundabout through my daughter. Monica appreciated the update and knowing what kind of life Riley lived out. I will need to come visit your torty-calicos. Do you remember Michelle’s cat Boots? She was a tortishell. I’m glad you were able to find a second cat who was able to fill that empty space pets leave sometimes. For us, Paisley has spied the opening in our lives and moved in to fill that hole! She has nice soft fur too. 🙂 Thanks for commenting! Thanks for such wonderful story, Melodie. We grew up with dogs, and never would have considered ourselves cat people. In fact, when my husband and I got married, we did not intend to have a pet at all. I still had my old guinea pig, but I’m not sure that counts, as she died a few months after our wedding. 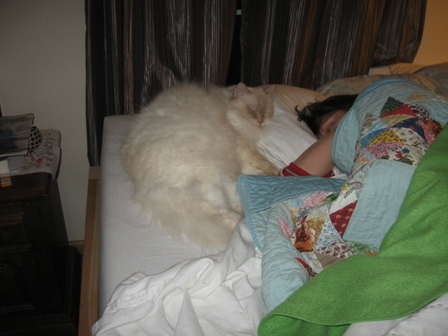 When our daughter was 5, a stray white cat adopted us on New Years Eve. We resisted, but she was insistent that she belonged with us, so we kept her. She was my daughter’s baby – just the thing for an only child. She had a multitude of health problems when she got older, and I did spend a lot of money on maintaining her; when she had to be put down, it broke our hearts. When she was getting on in age, we were again adopted by a stray – two, in fact. They were brothers from a stray that had adopted my parents. 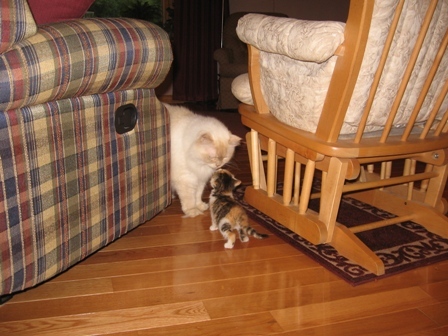 They brought out the kitten in our old lady for a while, and they were all so good together. When the brothers got older, the big one ended up with diabetes, and needed daily injections. He died of congestive heart failure, which just about killed us – he was our son’s baby. About three months later, the little brother died of the same thing, but I think it was really from a broken heart. He missed his big brother so much. That was the last straw for me. No more pets, even if they’re standing at my door soaking wet and frozen. I love animals, but I’m content to love other people’s pets. My heart just breaks into a million pieces when we lose a little friend. I’m a bit soft that way. I think I can understand how the loss of a pet friend seems too big and too much to handle–along with all the other losses we experience in life. I think I shared on this blog the saga of my father’s farm dog who almost tore their heart out too when they had to move away from the farm, and he kept trying to sneak back to the old farm (which was next door). Yes, we can love other people’s pets. My 91 year old mother goes to visit her upper 80s cousin when she wants to pet a loving kitty, and all three of them enjoy the visit. Thanks for chiming in here, Margaret. Hi Melodie. It’s Monica (Riley’s former owner). I was so sad to hear the news of his passing. As I read the blog I had tears in my eyes, yet I was giggling too. So many things you said about Riley brought back wonderful memories I had with him. He loved being outside, often plopped himself right in the middle of whatever I was doing ( working on the computer, reading, folding laundry). When he was a kitten he used to sleep on my neck, like a scarf. As he got bigger that became a choking hazard for me, so he moved next to my head and would rest his head or paw on my head and purr me to sleep. I still have a picture of him and those beautiful baby blues hanging on my fridge. I’m happy he brought joy to you and your family. Most of all, I’m happy he was loved! Thank you for taking such wonderful care of him. How very special to hear from you here, Monica! I’m glad that giggles could mix with the tears, which is often how it is when we lose someone. Did you use perfume? 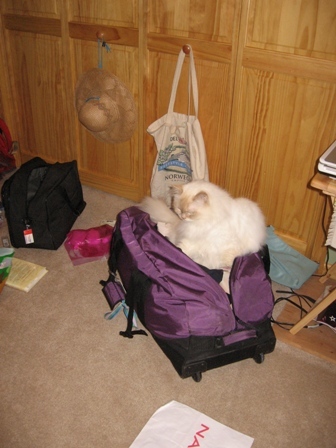 When my mother visited, who uses perfume, he would almost go crazy trying to get to her stuff. 🙂 And Riley did have the loudest purr! He was an awesome cat. Thanks so much for adding your memories which stir more of my own. « Great Southern Fried Chicken: Can a Yankee Master the Art?